Some people may consider 300 miles too far to drive for just a weekend. The Core Team scoffs at such talk. We love the road and, as readers of this blog have probably realized, we spend a lot of time on it. The Core Team traveled to the Delmarva Peninsula in October 2003 to participate in a family fishing trip. For those wondering, the Delmarva Peninsula is that region of the United States made up of contiguous sections of Delaware, Maryland, and Virginia and surrounded by water on three sides. Our destination this weekend was the home of Sara’s Uncle Ed and Aunt Belle. Ed and Belle built a remarkable house in Modest Town on the very eastern edge of Virginia, separated from the Atlantic Ocean by only a thin barrier island. One of the best features of their coastal compound is that its waters are actually part of the Chincoteague National Wildlife Refuge. As every birder knows, the protection offered by a National Wildlife Refuge seems to spur birds on to greater feats of fecundity, variety, and activity. That means that we saw lots of them. Since we didn’t arrive until late the previous night, this is when our vacation really began. We started the day by boating out to the barrier island, which was diminished considerably by the high tide. This is when we first noticed that the coast of Virginia is ruled by egrets. 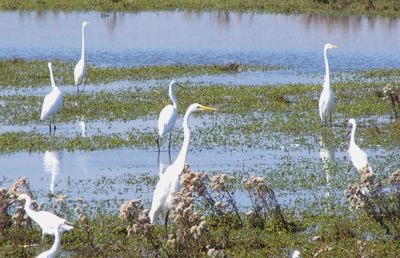 An improbably huge number of Great and Snowy Egrets call these wetlands their home. They work in concert with Great Blue Heron to ensure that one elegant long-legged wader or another is always in one’s field of vision. While egrets and allies protect the waters, a myriad of different birds rule the skies. Along the coast, raptors dominate, with Turkey Vulture, Osprey, and Bald Eagle most prominent. We also saw a good number of American Kestrel throughout the peninsula. However, the raptor of the trip, our new favorite, is without doubt the Northern Harrier. This will go down as the weekend the Core Team learned to identify Northern Harriers. We can now name them by their orange buff underparts and noticeable white band at the base of their tails, or by their low, coursing flight along the edge of a marshy bank. I should mention that we originally identified our first one of these as a Rough-legged Hawk, but who hasn’t made that mistake? As we boated out to the barrier island, we noticed tons of gulls and terns. Unfortunately, despite the ample opportunities they gave us, we just could not identify most of them. Their winter plumage really threw us off, as did the fact that we just can’t figure these birds out. We spotted Forster’s and Common Terns, and the usual gulls, and that’s the best we can do. No Black Skimmers though, which is a shame, because we’ve been told how awesome they are while feeding. As we pulled up to the tiny sliver of sand protecting Virginia from the rapacious Atlantic, we disturbed two immature Bald Eagles feeding on the beach. That sight made up for the lack of skimmers. Although the day was cold and rainy, we proceeded that afternoon with our fishing trip. We were with Sara’s father, Will, as well as her brother, Seth. Uncle Ed’s son, also Sara’s cousin, Hunter, was there too, and was actually the author of this scenario. In order to add even more family to the mix, we arranged to meet Will and Ed’s other brother, Hank at his place on the bay. Hank’s home is both beautiful and bird-friendly. His daughter, Susie and her husband, Jamie are both ornithologists. In fact, Susie put together a list of over 100 birds that she’s spotted just from the backyard. Leave it to Seth to point out that her backyard list is nearly half of the Core Team’s life list. Well, we’re both impressed and inspired. The birds sure do love that backyard. There’s an entire college of cardinals living back there, along with a host of other species. Hank took us out to Nassawadox Creek, which at first, didn’t sound like the kind of fishing we were there for. After all, where I come from, a creek is a little more than a trickle and a lot less than a stream. In Virginia, however, a creek can be a massive thing. At the point where it feeds into the Chesapeake Bay, the Nassawadox is as broad as the Hudson River. Everyone involved agreed that the fishing was good; it’s amazing how pulling a couple of decent stripers can make up for hours in the pouring rain!